Shop Ink For Cheap online at InkForCheap.com which is the source for low cost, high quality cheap printer ink cartridges and cheap toner / fax supplies. 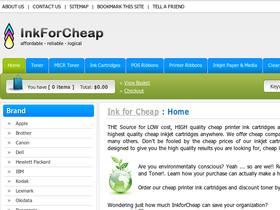 Ink For Cheap's mission is to deliver the highest quality cheap inkjet cartridges anywhere. Ink For Cheap offers cheap compatible and OEM ink cartridges for dell, epson, brother, hp and many others. Save on your next purchase from InkForCheap.com with Ink for cheap discounts, Ink for Cheap coupons and Ink For Cheap savings from 58coupons.com. InkForCheap.com is offering free shipping when you purchase over $49. Click link to start shopping. Enjoy 10% off your order at Ink For Cheap. Click code to view. For orders up to $49 Ink For Cheap is shipping them for a flat rate fee of $2.99. Over $49 shipping is Free! Click link to view. Pay no sales tax unless you live in the State of CT at inkforcheap.com. Click link to enter store.